I love bread, but as I’ve mentioned in the past we limit how much we eat of it. That said, growing up there was always a Babka in my house. In fact, between the bread and the sweets it’s a wonder I’m not diabetic. Those days are long gone though. Now we pay close attention to the foods we eat, and while we aren’t perfect all the time, we definitely monitor our intake. 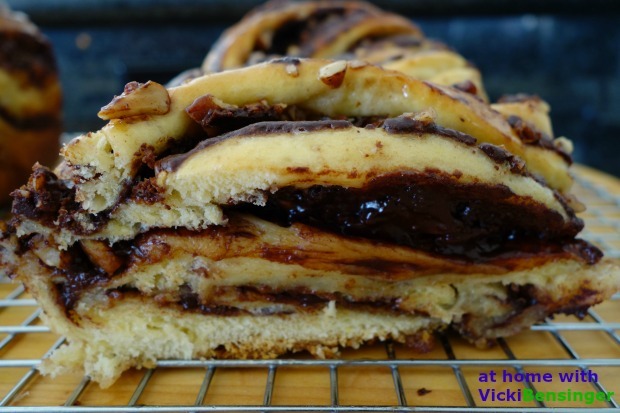 For those of you not familiar with Babka it is a spongy, brioche-like yeast cake made originally in Central and Eastern Europe, (now popular worldwide). Depending on the area it’s from will determine if it’s made in a bundt pan covered with icing, dried fruits, nuts and rum, or the version I’ve always had, made from a doubled and twisted length of yeast dough filled with cinnamon (often called the “lesser babka”) and/or chocolate (my favorite), and often topped with streusel. If you were a fan of Seinfeld then you might remember this episode where Jerry, Elaine, George, and Kramer were invited to a dinner party and decided to stop off and get a Chocolate Babka and Wine. Since they failed to get a number upon entering the bakery, other friends going to the same dinner party beat them to the counter and purchased the last Chocolate Babka. Just a fun little clip about Babka you might like. 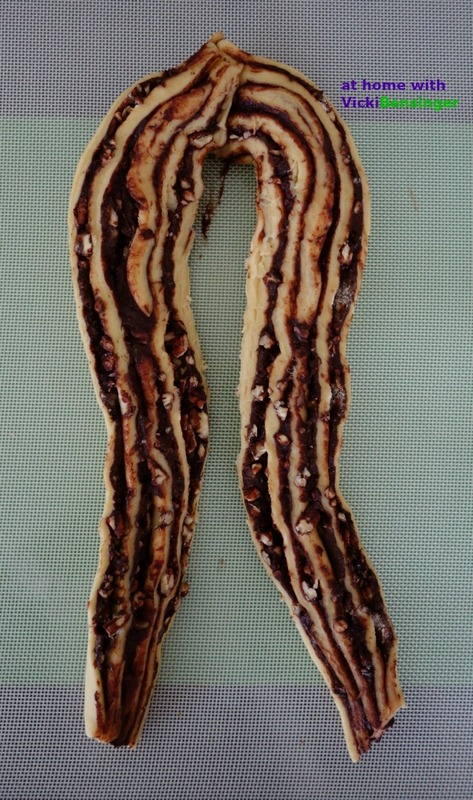 For some reason this past week I spotted a couple of Chocolate Babka’s online. One from the blog of David Lebovitz linking to one cookbook, and one that Beth Corman Lee created linking it to Jerusalem a cookbook I own. I’ve had this cookbook for quite sometime now on my iPad but never made the recipe. 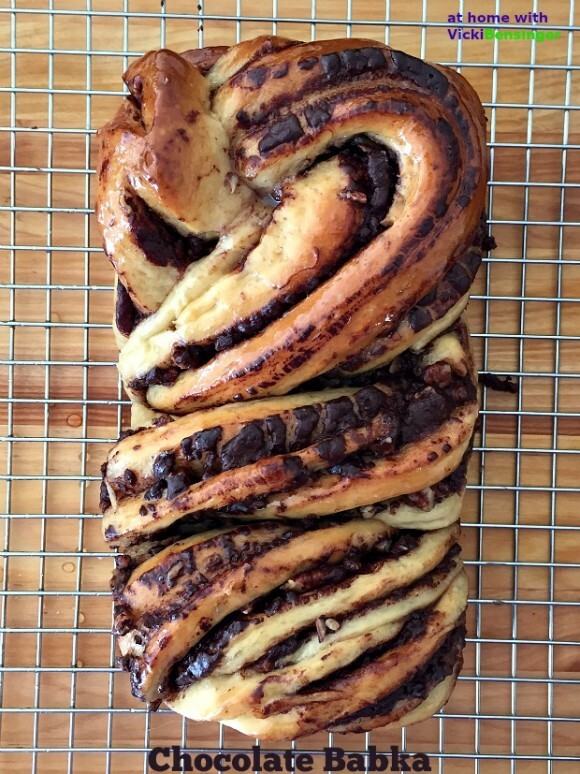 Since my 94 year old mom is a huge fan of Chocolate Babka I wanted to surprise her with it. So I set out to make it for the very first time. I read the recipe at least 6 times before starting. 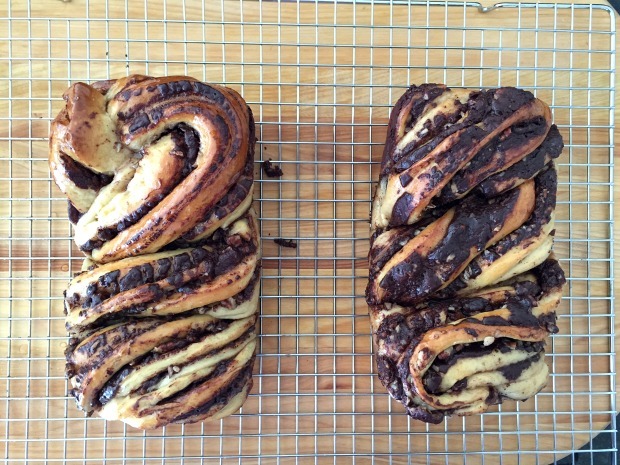 While some say it can be made in 1 day, 2 days is recommended to insure a perfect Babka. Fortunately Beth Corman Lee manages the website Tasting Jerusalem so when I had a few questions they were quick to answer. The recipe called for cocoa powder but didn’t mention if it was sweetened or unsweetened. I assumed it was unsweetened but didn’t want to assume after spending 2 days preparing it. Beth replied back that it was indeed unsweetened. The recipe also called to put wax paper in the bottom of each bread pan, then to put the braided dough in, and cook. I was sure that must have been wrong, so looked at the wax paper website and it said not to cook in the oven – I used parchment, and made the correction in my printed recipe below. 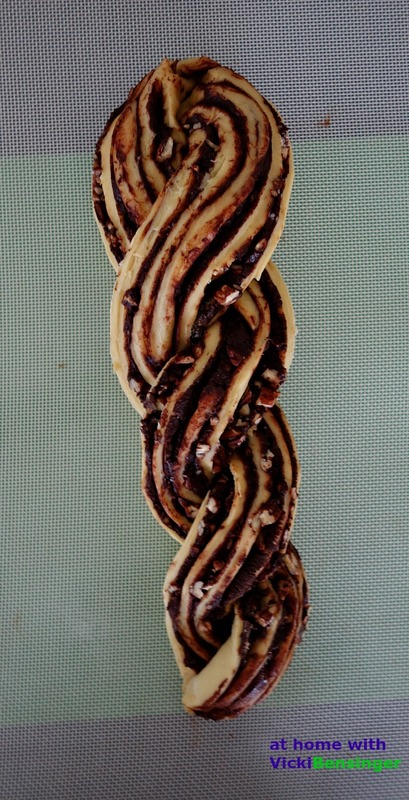 After I got that cleared up I started to create my first and beautiful Chocolate Babka. Upon finishing it I brought it over to my moms to sample. She loved it and so did I! The taste was absolutely perfect – not too sweet, and perfectly moist! Although the recipe took 2 days to prepare from start to finish, the results were stellar! I’ll definitely be making this again. *If you like this recipe please share it and retweet it to your friends. Reward yourself with this stunning and flavorful bread/cake. It's worth all the effort you put into creating it! For the dough: Place the flour, sugar, yeast, and lemon zest in a stand mixer fitted with the dough hook and mix on low speed for 1 minute. Add eggs and water and mix on low speed for a few seconds, then increase the speed to medium and mix for 3 minutes, until the dough comes together. Add the salt and then start adding the butter, a few cubes at a time, mixing until it is incorporated into the dough. Continue mixing for about 10 minutes on medium speed, until the dough is completely smooth, elastic, and shiny. During the mixing, you will need to scrape down the sides of the bowl a few times and throw a small amount of flour onto the sides so that all of the dough leaves them. Place the dough in a large bowl brushed with sunflower oil (I used a non-stick spray), cover with plastic wrap, and leave in the fridge for at least half a day, preferably overnight. Grease two 2¼-lb / 1kg loaf pans (9 by 4 inches / 23 by 10 cm) (I used an American 8x5) with some sunflower oil or non-stick spray, and line the bottom of each pan with a piece of parchment paper. Divide the dough in half and keep one-half covered in the fridge. 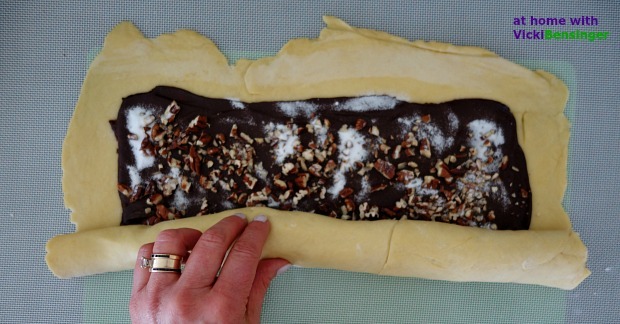 Make the filling: Mix together the confectioners’ sugar, cocoa powder, chocolate, and butter. You will get a spreadable paste. 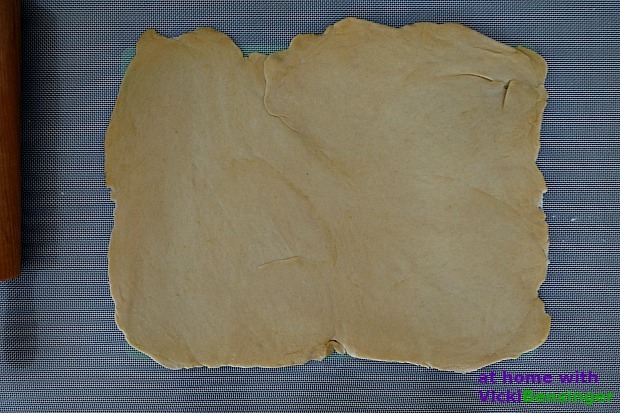 Roll out the dough on a lightly floured surface into a rectangle measuring 15 by 11 inches (38 by 28 cm). Trim the sides to make them even, then position the dough so that a long side is closest to you. (I didn't trim the edges since I would be cutting them after the dough gets rolled). 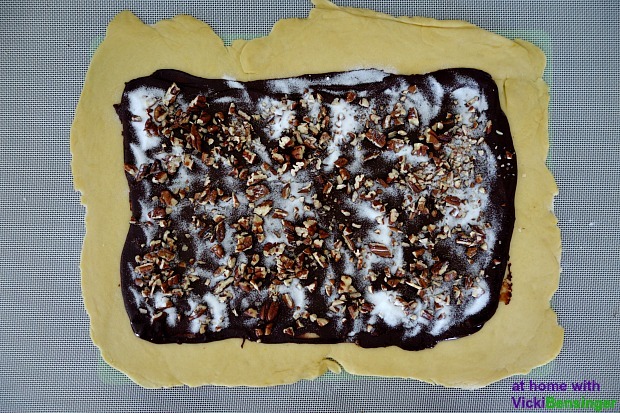 Use an offset spatula, spread half the chocolate mixture over the rectangle, leaving a ¾-inch / 2cm border all around. Sprinkle half the pecans on top of the chocolate, then sprinkle over half the superfine sugar. Brush a little bit of water along the long end farthest away from you. Use both hands to roll up the rectangle like a roulade, starting from the long side that is closest to you and ending at the other long end. Press to seal the dampened end onto the roulade and then use both hands to even out the roll into a perfect thick cigar. Rest the cigar on its seam. Trim about ¾ inch / 2 cm off both ends of the roulade with a serrated knife. Now use the knife to gently cut the roll into half lengthwise, starting at the top and finishing at the seam. You are essentially dividing the log into two long even halves, with the layers of dough and filling visible along the length of both halves. With the cut sides facing up, gently press together one end of each half, and then lift the right half over the left half. Repeat this process, but this time lift the left half over the right, to create a simple, two-pronged plait. 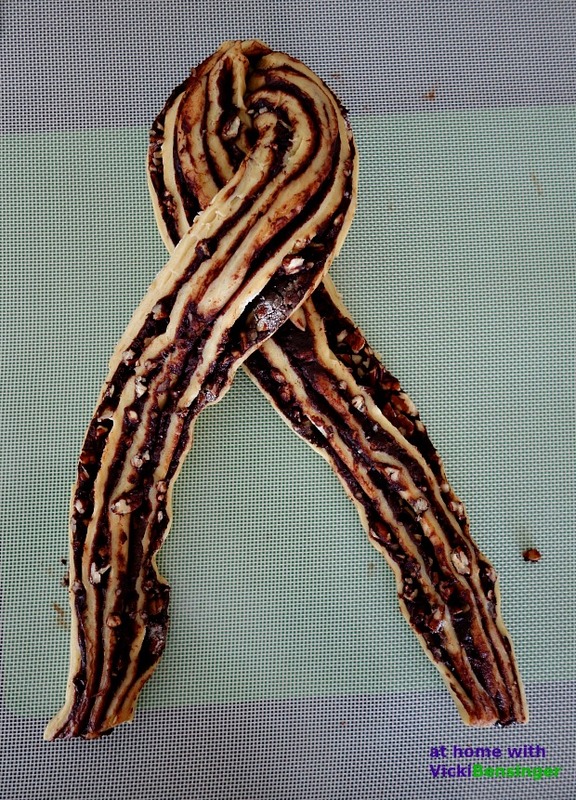 Gently squeeze together the other ends so that you are left with the two halves, intertwined, showing the filling on top. Carefully lift the cake into a loaf pan. Cover the pan with a wet tea towel and leave to rise in a warm place for 1 to 1½ hours. The cake will rise by 10 to 20 percent. Repeat the whole process to make the second cake. While the cakes are in the oven, make the syrup: Combine water and sugar in a saucepan, place over medium heat, and bring to a boil. As soon as the sugar dissolves, remove from heat and leave to cool down. As soon as the cakes come out of the oven, brush all of the syrup over them. It is important to use up all the syrup. Leave the cakes until they are just warm, then remove them from the pans and let cool completely on a rack before serving. Note: Initially when you place the dough in the refrigerator overnight the bread will not rise much, so don't be alarmed. The second time you place the twisted dough in a warm place to rise for 1- 1 1/2 hours it will rise considerably more. 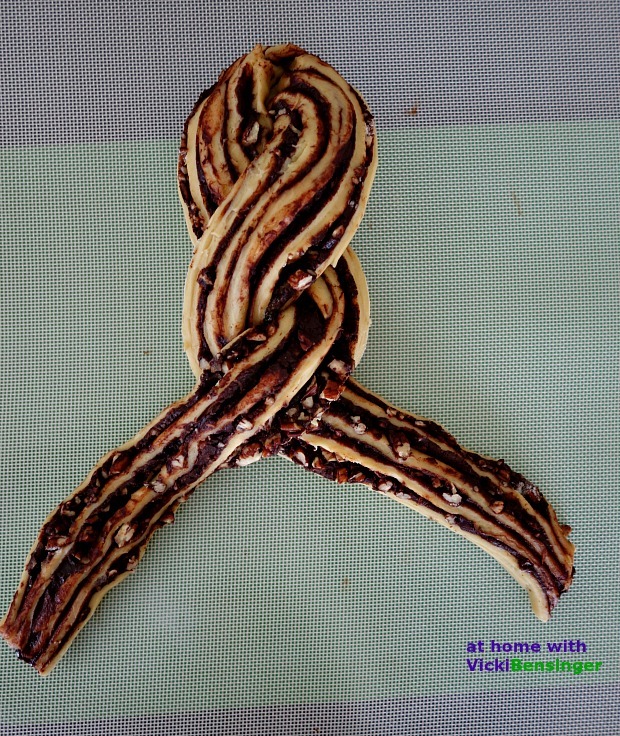 Yum, looks amazing Vicki! As does your mom – and she looks so happy to see the efforts of your labor! She loved it and thank goodness she does look amazing! Knock on wood she’s doing great and still volunteers one day a week. Great picture of your mom! And the cake, too, of course. Never made this. Not sure if I’ve even had it! But it sounds like my kind of food — thanks. My mom does look great and is healthy, happy and has all her facilities. 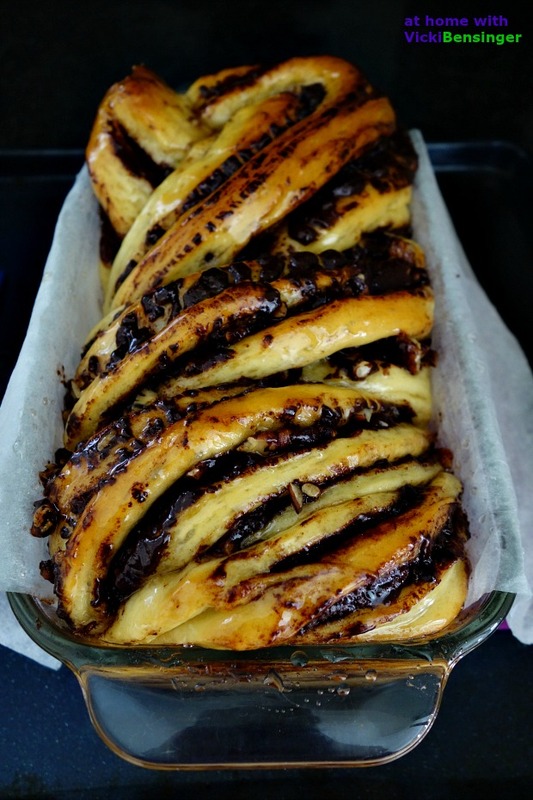 If you’ve never tried Babka you don’t know what your missing – it’s so good! I have to say the flavor of the babka is even better on day 2 and 3. I have always wanted to make this bread Vicki – it is beautiful! I am not sure it would last 2 or 3 days in my house – thanks for stopping by! The only reason the babka lasted 3 days is because we are empty nesters and had to control ourselves. This makes 2 loaves so the key is to share one with someone special. I made this for my mom but gave her a loaf and kept one for us. It’s so good. I hope you try making it. Thanks Liz, she loved it. It’s definitely challenging to restrain from eating the whole loaf. Just be sure your family is around when it comes out of the oven for all to indulge. Are you kidding me? This is an epic loaf of bread — who could control themselves around something like this? Thanks Sue. Yes controlling oneself isn’t easy. That’s why you need to share it. The recipe makes 2 loaves. Heavenly! I wish I could have this for my breakfast! You can Angie. Start by making it today or tomorrow and you’ll have it for the weekend. Enjoy!! 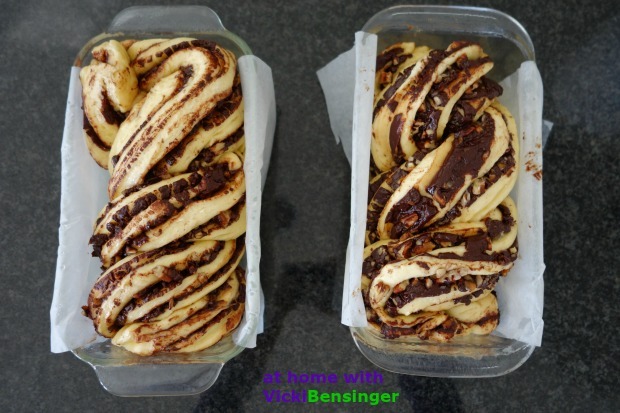 It was a pleasure virtually cooking along with you on this babka journey this week Vicki. And I especially loved “meeting” your mother. It is these experiences that make me love social media. Despite all of its crazy, it has really expanded my world in so many good ways. Look forward to meeting you in person sometime soon! And glad to have your input in our Tasting Jerusalem group as well! I agree social media definitely has it’s perks. I’m thrilled Tasting Jerusalem came to the rescue when my dough didn’t rise much when placed in the refrigerator. I almost tossed it thinking something went wrong. Had I not received a reply as quickly as I did from Tasting Jerusalem letting me know that was normal, it would have ended up in the trash. Looking forward to meeting you as well. Your mother is gorgeous! I love that chocolate babka you made. I think I’d fight mom for half. Thank you Maureen. ? I didn’t have to fight her for it, the recipe makes 2 loaves. However she would gladly share her loaf with me as I would mine with her. That’s what you do when you love each other! I know she is, but your mom looks amazing! So does your babka! Can this be made with a cinnamon/sugar filling instead? Rickie you can fill this with chocolate, cinnamon and sugar, fig spread or whatever you desire. Once you roll the dough, spread with your desired filling, roll up and finish the steps I’ve shown. Chocolate or cinnamon are traditional. 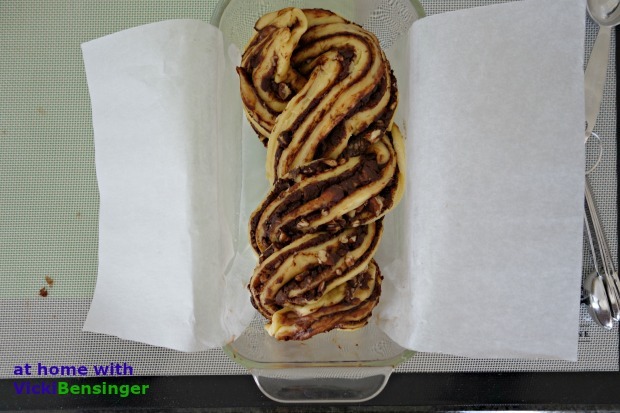 However that doesn’t mean you can’t go outside the box and create your own signature babka. Feel free to contact me if you have any other questions. I remember that Seinfeld episode! 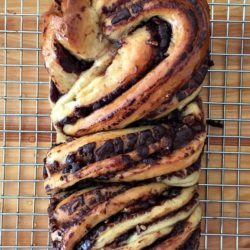 Miss that show 🙂 I’ve never tasted babka but have wanted to try making chocolate babka since the first time I saw one. I can tell your mom loves it! Cute photo! 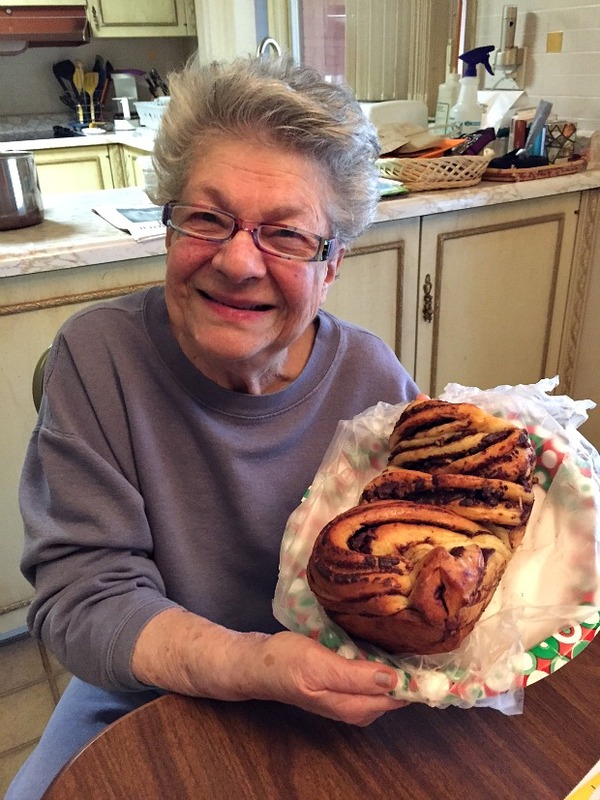 Your babka looks absolutely wonderful! What a special treat. Oh I do remember that episode of Seinfeld. 🙂 Didn’t know what a babka was and now I do. So very beautiful and mouthwatering! I am so inspired to make this. Thanks Vicki! Ohhhhh myyy goodness. Never seen such a beautiful bread before…. Also I appreciate that you gives pictorial tutorial . it makes very easy for us. cake that makes me hungry .. This cake really – really very attractive ..
of the photo – making picture alone makes me want to immediately try it ..
so in the forward to the next recipe ..